So I’m still teaching – this will be ninth year in the classroom. I still love it, though I am starting at my third school, so maybe I do need to move around from time to time. I have learned an incredible amount in the time I have been fortunate enough to spend with children. And now that I’ve been at several different schools, I have a pretty good idea of what I want in a classroom environment and in colleagues and administration. I move ever closer to where I want to be and where I think I can be most helpful. It’s been a good near decade, despite my lack of contributions here. One of my best victories is the acquisition of a class dog. 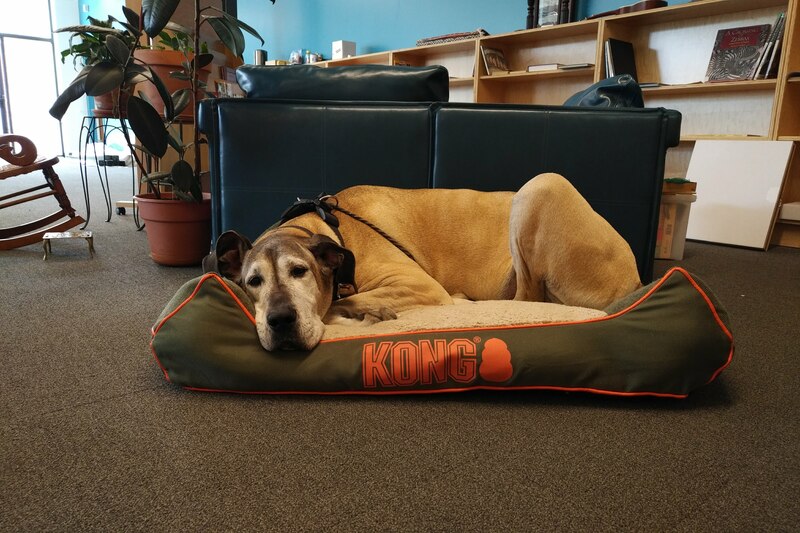 She’s a rescue, older and enormous. She joined my classroom three days a week when I started at my new school this fall. I can’t even describe all the magic that happens because she’s present with children, but I suppose one day I can try my hand at it and post something that may or may not be persuasive or interesting. Kenner chilling on her bed at school. Anyway. I thought that if there were someone still hanging around who was interested in seeing what I am sometimes up to, then I’d help them out by sharing here that as of this year, I’m semi-occasionally contributing to the Villa di Maria Montessori school blog. It’s a wonderful place to get information about Montessori, with beautiful pictures from a variety of talented photographers who are part of the VdM community. My first post, fortuitously celebrating the International Day of Peace (September 21), has gone up. I encourage you to check it out. Wow. I’m not sure I even know how to do this business anymore. Hmmmm. Let me give it a try. When I’m in savasana (corpse pose) at the end of a yoga class, or even at other times, such as when I’m falling asleep, when I’m in a forward bend, or even when I’m just standing around observing the world, I get this recurring mental image. In this image, my head has a hinge, and the top of my skull flips open. What is inside it, some kind of glowing, whitish ooze, start to flow/tumble/slither out. The ooze, I understand, is the essence of whatever is me. It leaves me, bit by bit, and dissipates into the greater universe. I am literally unmade. Yeah. I have no idea what it means either or where it came from. It’s just there. I admit I find it fairly comforting. Maybe you have a similar thing? It’s kind of nice, actually, to have a place to set things down, even if I don’t use it much. So Fitbit is now the boss of me. Summer is always the time where I get to pay attention to my body and get back into shape, with grand ideals about continuing into the fall and winter and then having that kind of die off around November when it’s too cold to run outside. I also do some general health stuff – not strictly fitness – like try to tune my palate to crave less sugar and lay off the carbs quite so intensely. I love sugar like a person with a brain that wants sugar, so it’s tough, but I’ve made some moves over time that stuck. For example, I walked myself off sugar in tea. Used to have two teaspoons in every cup, and three or so years ago I just started using less and less until I wasn’t adding sugar anymore. Stuff like that. Nothing drastic. Then earlier this year my spouse got a fitbit and I watched him lose 30 pounds and just be more dedicated overall to moving and being active. His fitness level has improved. So I got one, too. And now the device is the boss of me. I won’t bore you with a lot of detail about weight and exercise here, but I’ve had the thing roughly 30 days, and since strapping on the actigraph, I have walked 10,000 steps every single day. That little buzz that I made it…it’s really motivating for me. I don’t know why. Just works. And it works out to basically two walks a day, which isn’t bad. During the 30 days shown on the graph, I also started C25K (again, for like the third or fourth time), and started back to doing yoga regularly (which I hope to be able to sustain in the fall, when school starts. I’ll find out in a couple of weeks whether this will work out or not). There’s a kind of steady climb on the graph, and then a sharp drop below what it was when I started monitoring. Is my resting heart rate affected by the high intensity workouts, the running? Or is it the yoga? Or both? Or neither? It’s kind of neat how it has plummeted, even though I don’t really understand why it would do that. 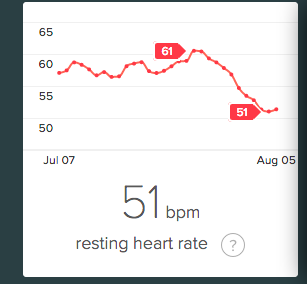 Today I sneaked a peak at my fitbit during yoga, right before savasana, and my heart rate was clocking 52. That’s the thing about having the data always there. One wants to monitor it. How low can it actually go? Is it going to climb back up? Level off into the mid-50s after a bit? I have no idea. Stay tuned. I’m going to kick the tires on this thing and see if it goes. Because I like to make things complicated, and perhaps overthink things, I made up a reason to stop blogging which was more than “way too busy with other things”. And while “way too busy with other things” was technically true, and a lot of things fell out of my life when I started teaching full time, I was also having a crisis of faith, a crisis which applied not just to my blogging but to my writing generally, and even to sharing anything at all. I don’t know how this is going to sound to anyone not inside my head and I’m sorry in advance if it sounds precious or overdramatic or obnoxious or excessively self-deprecating. On the inside of my head it’s a simple enough truth I wrestle with and it’s this: I’m pretty sure no one needs to hear what I have to say or read what I have to write. This isn’t a particularly painful or upsetting idea to me, by the way. I’m just trying to work through what I do about it. Of course there are all sorts of reasons to say and write and post beyond whether people need to read or hear it. I get that. But for me it is – at least in great part – worth doing if I have messages to impart. And I’m just not sure that I do. Or ever did. Somehow having the ability to blog and write became synonymous with it being a good idea for me to do so. Talk about unexamined assumptions. Because when I look around I find I don’t need more of people’s ideas and opinions and thoughts and input and stories. I need less. I’m too connected. And so why would I add to the too much? Thus begins the crisis of faith, by examining what had heretofore been a happy, simple maxim: I can write, and pretty decently, so I do. You can see that this line of thinking more or less leads to me never ever blogging or writing again, because measuring the value of “something worth saying” is super nebulous and abstract. And you can see by my typing right now that it chafes me to buy into that unmeetable standard and give up, despite being more or less proud of my awesome skill with giving things up. Not telling anyone I’m having a crisis of faith until it’s mostly over is also standard operating procedure for me. I’m not a sharer. My internal landscape is mine. And private. You have your own. So it’s weird that I blogged so openly and directly for as long as I did, actually. Part of that worked by imagining myself with no readers, like you tell yourself people aren’t paying that close attention when you’re on stage or that no one cares if you mess up a little on this project you’re creating. The directness isn’t a problem for me. Neither is the honesty. But the continual revelation? That’s hard. And, I suspect, boring to read. So the world and its people don’t need this. Don’t need me typing at them. Now I have to decide whether I do it anyway. It’s a big decision, and it’s also one I have to keep making. Maybe today I decide, yes, I do it anyway. Maybe tomorrow I decide something else. Certainly there’s been a whole long string of days where I decided not to, hasn’t there? It definitely helps that people are largely on other platforms like tumblr and twitter these days, so that whole “no one’s reading this” is still working to my advantage. Generally, I’m at a point where I realize that most of the time my best move is to STFU and listen. That’s kind of a hard place to stand for someone with a lot of words. Which I definitely am. Blogging feels like the opposite of listening. It feels like piling up more noise, obscuring clarity. To be clear, I won’t accept anyone else’s assertion that I have things worth saying. That’s a measurement that only I can (and get to) make. I’m not actually fishing for input here, though of course the available comment section says you’re welcome to provide it. That hasn’t changed. This whole post is actually just throat clearing for something I do want to address, a topic I (possibly foolishly) would like to invite people to think with me about. But I don’t know if I can. So I poke the blog. See if it still stands. See if it’s going to fall on me or bear up the weight of my din and blather. One last word. This post is excessively navel-gazeish and introspective. It’s not about you and your blog or your fiction writing. I’m not seeking an army of blog and/or writing deserters to take up this doubt and uncertainty as their own. All of this is likely invalid for you, at least I hope it is, and if it is, don’t put the shoe on. I’m not secretly telling you you’re wasting your time. Because nobody and everybody is wasting their time. You choose for you. I gotta choose for me. Lianne La Havas, Is Your Love Big Enough? It’s been more than a year since I posted. And I was only posting sporadically before that. I am unsure what I want to do here. Maybe blogging is over? Maybe no one reads blogs anymore. Or maybe the small set of people who may at one time have been interested in what I would write and post are no longer interested. Who knows? I still make blog entries in my head from time to time. And I miss blogging, at least a little. Maybe more of those in my head things will come to the page. I had to go into the admin module to upgrade WordPress which was so outdated it was like a magnet calling out for someone to hack the site. And that would have made me grumpy. Instead the upgrade was so easy and now I’m already in the control panel and it totally makes sense for me to type something and post it! Life’s satisfying. Good things happen to me on a regular basis. This summer has been a spectacular time off, after three summers spent working far too hard at getting my AMI elementary certification. First summer off in three years and how I am cherishing it! I have not gotten accomplished everything I would wish to (of course) but I have done quite a few things that had been waiting to be done for a long time. Nothing earth shattering, just worthwhile. Such as finally getting the bedroom to be the secluded, refreshing, neat place I want it to be. I went to a free class and made a necklace! I took apart a three cube and spent lots of hours trying find 7mm glass beads (without success, any ideas?). The internet gave me a lesson on making onigiri and I may just turn into a person who makes themselves bento lunches. Got shelving in the front closet and now it’s all neat and organized and stuff fits in there. writing or editing or submitting stuff I’ve written (I wrote zero new stories so far in 2012, and I think I wrote zero in 2011). Hey, look there, will you? After like a year and a half of co-editing PodCastle, I’ve finally narrated a story! It’s Maria Deira’s excellent “The Giant Malheur Park“. Amusing fact: I wrote the author to ask how to pronounce Malheur (and a good thing because my instinct was dead wrong, not MaLOOR at all) and she helpfully provided a pronunciation for her surname, Deira, in the return email. Which I think I more or less had covered, but how was she to know? Author Maria Deira wrote one of my all time favorite stories on Pseudopod: Regis St. George. That one is masterfully read by Mur Lafferty, who now edits EscapePod. I know, small world, right? PodCastle’s got some great stories in store for the summer. I can’t wait until you get to hear them! Also, next week begins the last summer of my Montessori training. Wish me luck! I expect to be crazy busy for the next nine weeks or so and I’ll be taking both written and oral exams and handing in lots and lots of charts and album work. Also, also, I’ve started on this new hobby, called Zentangle. I bought the first book at ArtMart (aka that store where I spend too much money) and started doing them last week. I love this work, and I can’t wait to give lessons on it to my kids. I think this may be my elementary level walking the line or handwashing. One of the things I really like about it is it provides lots of ideas for patterns which can be used to embellish work. And also a method for coming up with your own patterns to use. Yay! Ok, I’m off to eat at the Everest Cafe, which I’ve heard a lot about but never eaten at. Then over to paint charts with one of my classmates. Life is good. Look after yourselves.